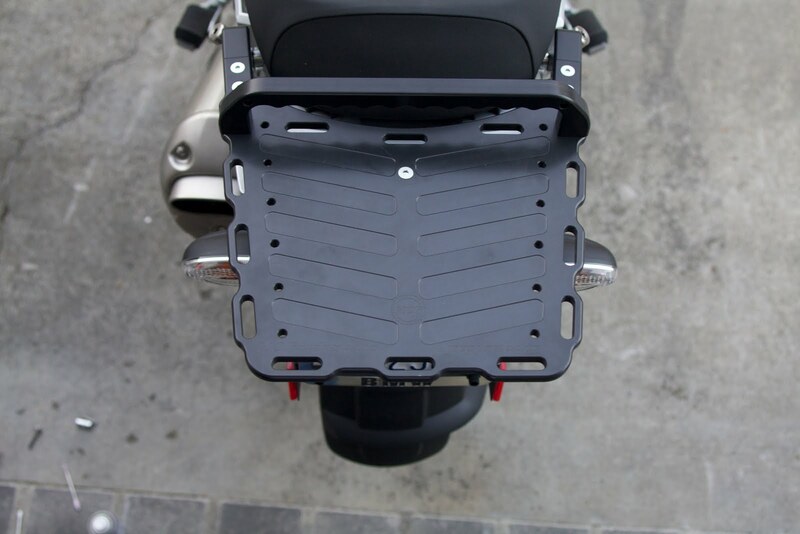 As I wrote in my last posting, I received and installed the MC Products Low Mount Luggage Rack. It is a really fine piece of hardware made from black anodized aluminum, thick, very stable, very well made. The overall quality of the rack is really incredible and it is also pretty well thought out - except one little thing and I will come to that later. As you can see, the rack mounts really low which is very good for a low center of gravity even with luggage mounted. The OEM rack is completely useless in that regard - it's a piece of plastic that is useless for luggage but okay for using as passenger grab handles. It is wide and deep enough to provide a solid platform and given the front and rear loops can take a duffle bag with ease. The grab rail is well made, too, easy on the hands, feels really solid and can be removed if you want to install a top box. Which I wanted to. So I removed the grab handle. And here we go with the one and only downside of this rack: it has no handles at the side. And it mounts so low and close to the frame that there is no way of holding the bike with it. Now, as I push my R1200GS rear first into the garage which doesn't have all too much space, the rack didn't give me any support after I removed the grab rail. I had nowhere to place my hand and if the bike would have gotten even a little bit out of balance and dropped away from me, I would have had no chance at all of holding it. No leverage. What a pity. I absolutely love the rack but I can't use it to push my bike into the garage. Making it about one inch wider to each side right at the attachment points so that you can get your hands behind the attachment part that goes to the side of the bike. I'm not sure how this would work with cases though, therefore the other option. Add a little "nose" in front of the side attachment points with another pre-drilled hole and provide side handles that attach to this and the slot where the current grab rail is mounted. 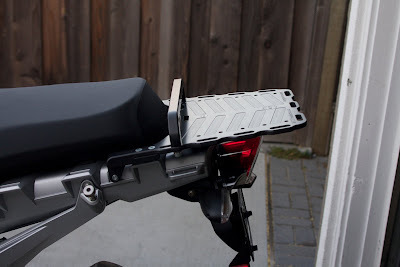 this would be better for the passenger as it is accessible even with a dry bag or so attached to the rack and it would provide the handle the rider needs to push the bike around in tight spaces while still being able to mount a top box. This is one of the best luggage racks I have seen so far. As long as you don't plan to use a top box at all with it. Would I buy it again? No - not in the current form. Would I recommend it? Yes, if you don't use a top box, this rack is awesome. Perfect quality, well thought out, enough space. It is on the pricy side, but it's worth it. I had to sell it as it was not what I was hoping for. It was really, really close and I would gladly get one that has one of the improvements mentioned above (preferably the second one). I would appreciate if it would not come more expensive with the side handles as it is already on the expensive side compared to others, but I would gladly pay for the raw quality and craftsmanship. I would have rated it 5 (or 6 out of 5 ...) if it had the side handles. I'm trying to track down this luggage rack. Any chances you'd be interested in selling yours or know of where I can find one? Probably only on the used market. I don't have mine anymore and the website of the manufacturer is offline.